Clutter clearing & organising your wardrobe, home or office. Single rooms or full house. Stay clutter-free with follow-up coaching call. Auckland, Greater Auckland, Hamilton, Waikato, Bay of Plenty. Further afield by negotiatio­n. Half days, full days, or multiples. Standard hours 10 to 5. After hours, weekends by arrangemen­t. Holidays - available except statutory holidays. "Linda's done a brilliant job... we worked very well together. And now my room looks like a dream. I'm feeling much lighter... and happy, and smiling, and it's a real load off my mind, getting rid of all these bags of clothes. Thank you, Linda"
Getting help with clearing your clutter is an investment that makes good sense. * It saves you time and money. * You become more efficient & productive. * You feel better about yourself and your life. * You become clutter-free faster, so you can get on with what's important to you. 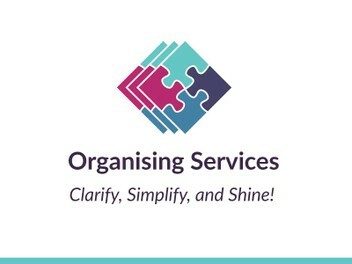 Organising Services is a new business looking to build a reputation for excellence. My goal is to provide great service and 100% customer satisfaction. I guarantee that you'll be happy with the results of our time together, or I'll put it right. Decluttering and organising bedrooms, bathrooms, laundry, kitchen, office, lounge, garage - or the whole house. Wardrobe decluttering. Dealing with paper clutter - set up systems, sorting, processing, filing. I'm a Professional Member of IOPO, the Institute of Professional Organisers. I really enjoy sorting, organising, and clearing clutter, and I would be honoured to help you clear yours. I'd like to get to know you and help you experience the joys of Life After Clutter. I'm keen to extend my range of services - it's quite possible that I can help. Email or call me and ask. I am beyond impressed at the results we received by having Linda for the day. She was so knowledgable and made the process fun. She mediated my partner and I through some disagreements which would of turned the process into a disaster. She is a very hard worker and I would highly recommend her for any job. In one day we organised our whole office, garage, shed, and spare room all for a very fair price. We will certainly be using her again!! I cannot say enough how great Linda is at her job. She is extremely talented at her field. We had her come for the day and we tackled most of our home, inside and out, and she remained excited and knowledgeable throughout the whole process. My house has never been so organised!! I would and am recommending her to anyone who is looking to get themselves in and organised home or office.